14 x 12.3 x 6.7 cm. At 1500 grams and 6 inches in length, it’s the size of a large grapefruit or small melon. 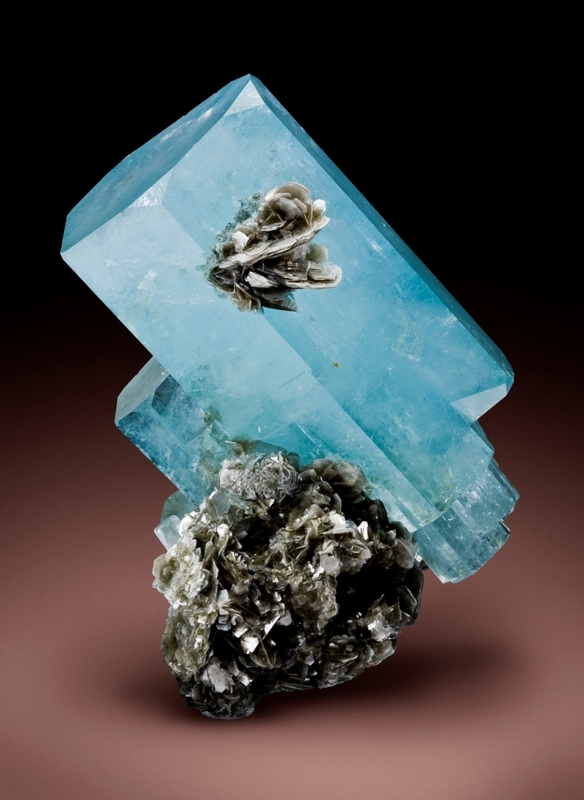 This doubly-terminated "cannon" shaped aquamarine is truly huge, but aesthetic despite its size. This is one of two great specimens that came together from a single pocket in 2007. The piece is complete all around, with no repairs, and only a small ding and a shallow contact/damaged spot on the lower-rear tip of the bottom. This doubly-terminated crystal is perched on a natural pedestal of bladed, roseate muscovite matrix. The unusually high glassy lustre, geometry, and gemminess (especially for the size, as most large Nagar aquamarines go more opaque) are superb. Photo by Joe Budd.